I am excited about this and I can’t wait to make this again! 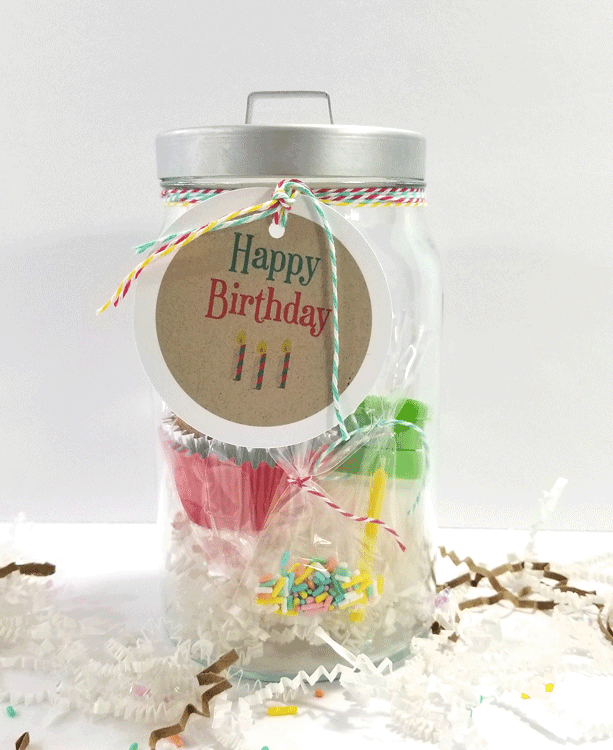 I am showing you how to create a birthday gift if a jar…or more like a birthday in a jar! It’s all the fixins’ for a tasty, festive cupcake! I wanted to create something festive but pretty simple. This post includes affiliate links for your convenience. You can read my full disclosure here. Glass Jar – mine came from a friend but I think it came from Ikea. 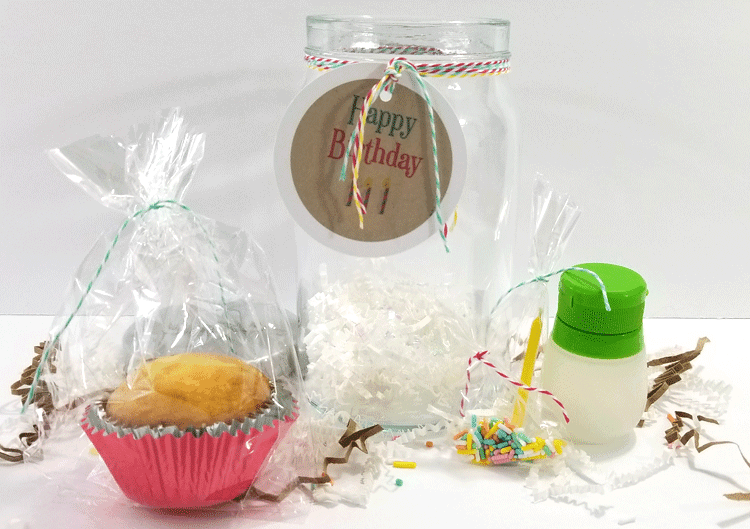 Bottle for Frosting – I got mine from the dollar store but this link is to Amazon. Cello Bags – different sizes. Once you have all of your supplies, you can put everything into the jar. So this is how I did that. I started with the cupcake. It was baked in a foil cupcake liner but it really needed another color so I plopped it into a red liner. Then it got placed into a cello bag and tied at the top with bakers twine. I trimmed the bag at the top as needed. Do the same with the candle and the sprinkles. 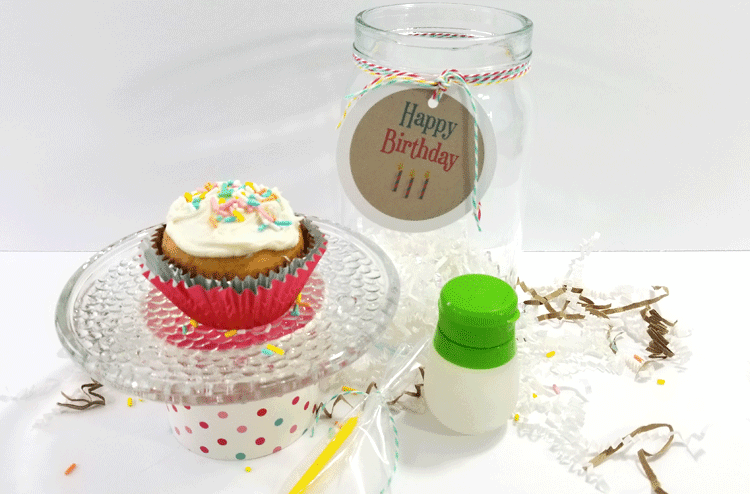 Place some of the tissue filler into the jar then add the cupcake all cute in its cello bag! Add the sprinkles and the candle. 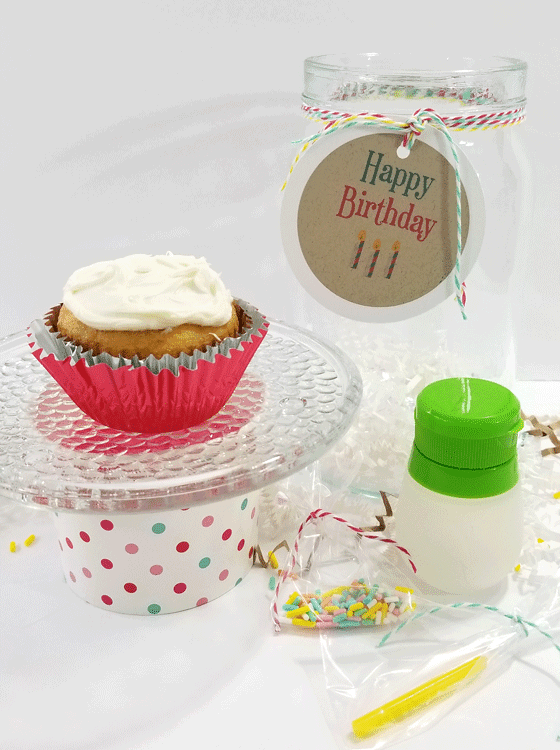 The frosting went into the little squeezable bottle so it could easily be squeezed onto the top of the cupcake. You could include a plastic knife to spread the frosting. This really worked the best. Once everything is placed into the jar you just need to add the tag! I created this tag in Photoshop Elements. If you would like to know more about this awesome program you can read my post about why I love it so much here! Once it is created and saved as a png file all you have to do is upload it to the Avery website, (this is on the box of stickers if you forget) . You choose your size template, upload the design and print the stickers. It really is that easy. 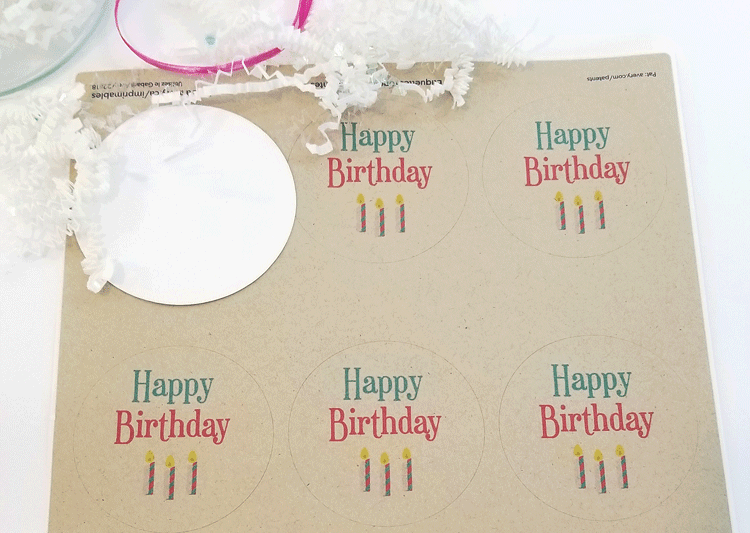 The Avery website allows you to choose the sticker sheet size you have purchased and upload a design. 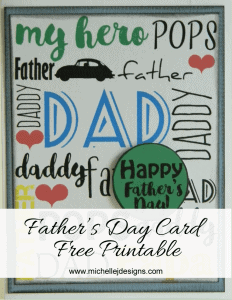 Then when you tell it to print (from the website) it will print your stickers perfectly. It was so easy to do. Here is the design for the tag. And, here is how they turned out printed. Even with the kraft paper the colors came out quite nicely! And the best part is that they are already cut into circles. These tags are 2.5 inches so my circle tag is 2.75 inches. I cut it out on my Silhouette Cameo! 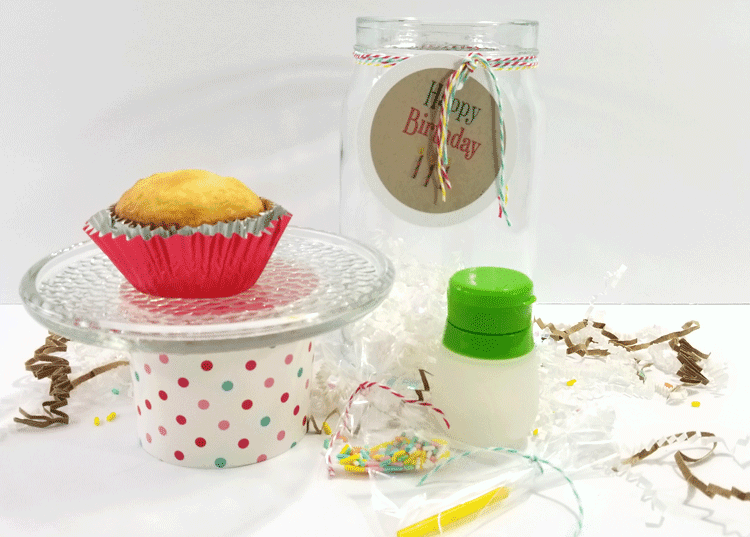 Place the printed kraft sticker onto the white background circle and attach it to the jar at the top. This is how it would look to receive this gift and use it! What do you think? I love this idea of getting a special cupcake just for me! My dad would call it a “do it yourself kit”! 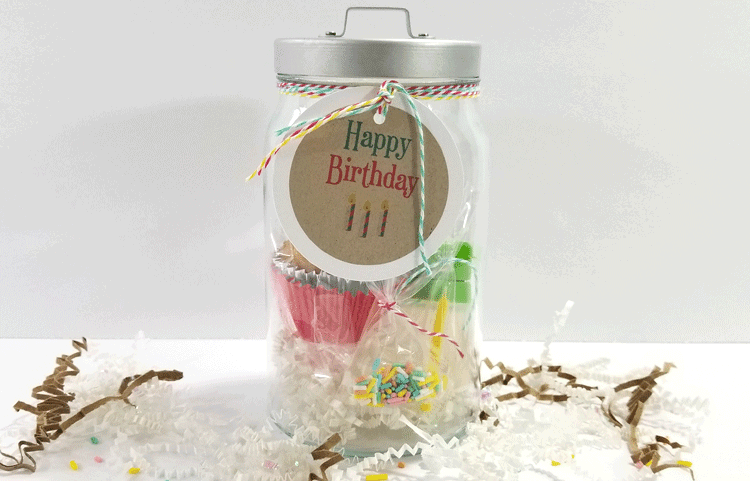 Don’t forget to check out some of my other Jar gifts! St. Pat’s Day Survival Kit – You need this if you want to survive the day in March during the parade and afterwards! Relax Friendship Gift – treat your friend to some wine and chocolates. Everyone needs some cheering up from time to time when they are feeling stressed. Thank you Michelle. I thought it was fun. I hope your daughter gives some out. 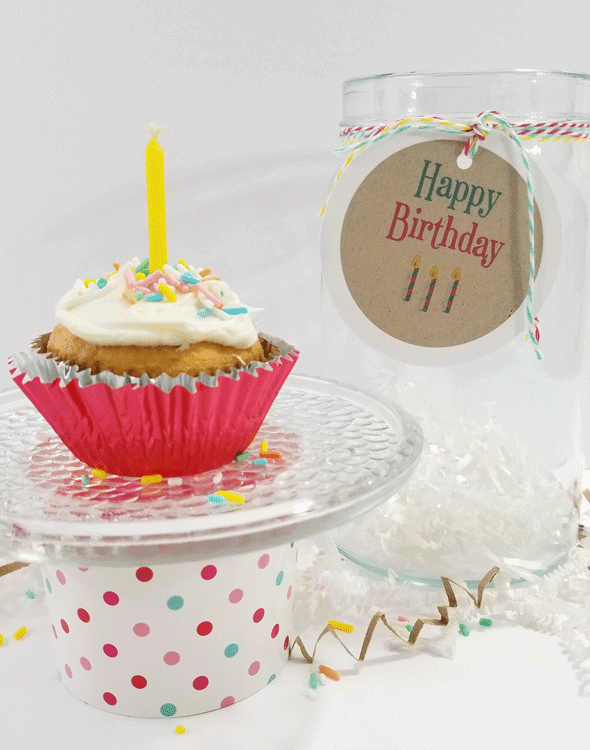 I Know I would LOVE to receive my own little cupcake for my birthday. Thanks so much for stopping by! I just love this. 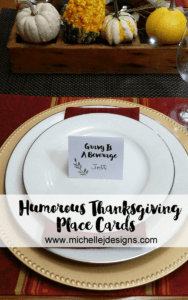 what a great idea and fun to make too. I think everyone would love this, Michelle. great for a kids project too. Yes. I think kids would love to help make these to give to their friends. So fun! 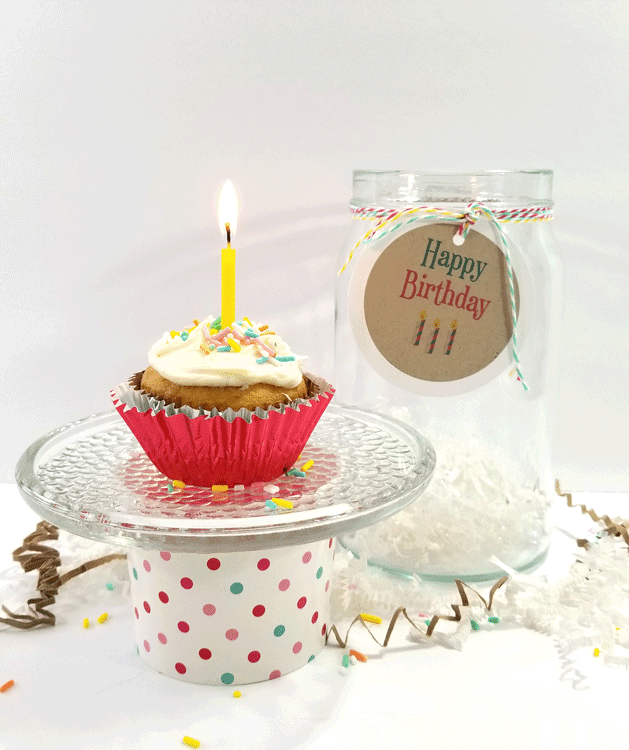 cupcake in a jar! this is so cute. birthday people will rave about this when they receive it and it will be a lasting memory to them. Thanks Sue. 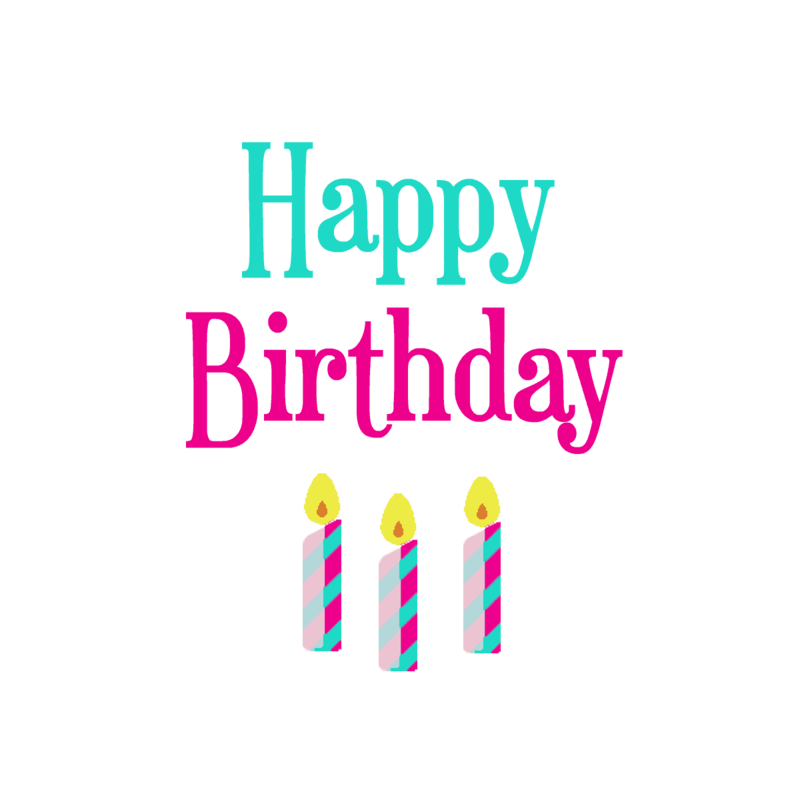 I just thought it would be fun little birthday surprise for someone!